Many computational applications naturally involve not just a set of items, but also a set of connections between pairs of those items. The relationships implied by these connections lead immediately to a host of natural questions like is there a way to get from one item to another by following the connections? How many other items can be reached from a given item? What is the best way to get from this item to another item? Example of computational applications can be maps, social networks, circuits, computer networks. To model such situations, we can use abstract objects called Graphs (In simple words when I say Graph, it is an abstract data type which means that they aren’t available as an inbuilt data structure in a given language and one has to use some other data structure to represent Graphs). In below fig. 1, a network with routers, P, Q, R, S, T and the links between them can be represented diagrammatically by means of points and lines. The points P, Q, R, S, T is called vertices, the lines are called edges, and the whole diagram is called a Graph. An undirected, unweighted graph models a relationship between vertices (p, q) without regard to the direction of the relationship. For instance below is an edge (p, q) which represents that P is connected to the Q and vice versa. Also the edge (p, q) doesn’t have any weight associated with it. In networking terms, weight will be equivalent of the metric / cost of a link. Obviously this doesn’t sound the right way to represent the networks as we have cost on the links and they can be asymmetric. In the case of Directed graphs, edges are ordered pairs – the order between two vertices the edges connect is important. For instance (p, q) models the relationship between vertices p–>q, and (q,p) models the relationship q–>p. In the below fig. first graph represents (p, q) and there is no edge from q–>p, second Graph contains two edges (p, q) and (q, p) representing connectivity p–>q and q–>p. 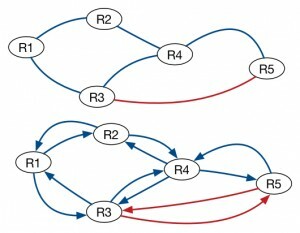 One way traffic roads are one suitable example directed graphs. These graphs essentially model graphs where there is a numeric value associated with edges representing relationship between vertices (p,q). So for instance in the below directed graph, we have weight associated with the edges. (p,q) = 10 and (q,p) = 5. Now this looks more like a right way to represents the network, we have metrics/cost associated with the links which can be asymmetric. So from here on we will be using — Directed, Weighted type of graph to represent our network. 2.0 How are Graphs represented? If you remember I mentioned earlier that Graphs are abstract data types and now we will take a peak at some common ways to represent a graph. We will use below sample network as an example where all the blue links has a Cost 10 bidirectional and Red links has Cost 20 bidirectional. So one way is to use a N x N two-dimensional matrix to represent the graph where N is the number of Nodes. The value stored in the cell at the intersection of row V and column N indicates the cost. As you can see [R5,R3] and [R3,R5] has cost of 20 and every other cell value has cost of 10. An empty cell means no link between given nodes. Simple way to represent a graph. Worst case for accessing a specific edge (u,v) is in constant time ? In simple words, doesn’t matter how big our graph (network) becomes, accessing an edge for a pair is constant which is a good thing. Optimal structure for Full mesh graphs where each node is connected to every other node. 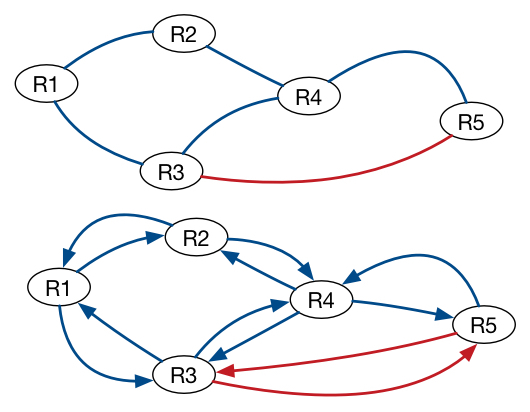 Inefficient way to represent sparse networks which are more realistic. As you can see that many cells are empty which means we will be wasting memory. If you want a fancy way of saying that then what I meant was that it adjacency matrix uses ?space which means a lot of space. If you look at our example, we have 25 (5 x 5) memory cells out of which 11 are filled and 14 cells are empty i.e 56% of empty spaces. In this representation space requirement for storing information is where n is the number of vertices and m is the number of edges. As an example just to have an idea, we need to have 5+12 where 5 is the nodes and if you count the total number of lists for each of the 5 nodes its 12 to represent fig.5 . So you can see its more efficient to store sparse graphs compared to Matrix representation. Cons: The cons with this representation here is that for certain operation, it may take more time for instance getting a specific edge between two nodes like (u,v), we have to go to that Node in the master list and then traverse the list to see if that edge exists compared to matrix representation where it takes a constant time to do this operation. Few other ways to represent that are Edge List and Adjacency Map but I will leave that as an exercise to the reader. Before we dig into Dijkstra Algorithm, I want to cover another basic entity called Priority Queues which will be used by Dijkstra implementation. Like in a real life Queue, it allows to add elements to the end of the list and removes the element from the front of the list, however in the case of Priority Queue the logical order is determined by the Priority of the items in the queue. Highest Priority items are in front of the queue and lowest are in the back and the middle is arranged accordingly from Highest to lowest priority order. For instance, assume that there are a bunch of people who are waiting to board an Air Plane, and they all are aligned according to their seat numbers assigned to them in the Queue. The guy who has the first Seat Number in the ticket is in the front of the Queue and the guy with the Last seat number is at the end of the Queue. Suddenly few more people show up at the Boarding area and they may have seat numbers assigned to them, which may put them in the front, middle or last of the already existing queue. So rather than putting these people at the end of the queue, we re-arrange the Queue according to the seat Numbers they have to make sure the Property of the Queue is maintained i.e. The guy with the first seat number is in the front and the other guys behind him are aligned accordingly to their seat Number. Now in our problem scope of Path Computation, a Node with the shortest distance will have the Highest priority and will be in the front of the Queue and the one with largest distance will be at the end of the Queue. Now the next question is how can we implement a Priority Queue. 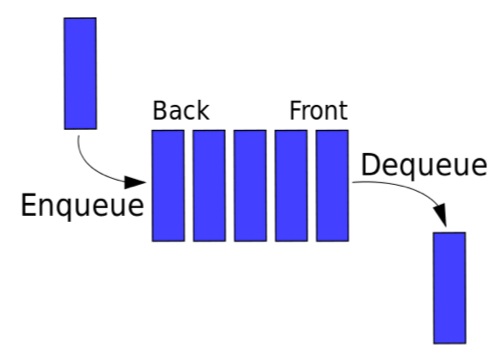 In our example, we will be using Min-Heaps to represent a Priority Queue. First of all what is a heap? 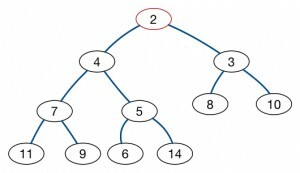 Heaps are binary trees which satisfies the heap property i.e. All nodes are either greater than or equal to (known as Max heap) or less than or equal (Known as Min heap) to each of their children. In this post, we will be looking at Min-Heaps where a node is smaller than their children’s. For example in below Fig.8, Root Node “2” is smaller than both left (4) and right (3) children and so on. In a Min-Heap, The Root Node is always the smallest node. So in our scope of path computation, the guy with the lowest distance will always be the Root Node and whenever we have to find the next lowest distance element (Highest Priority), we will just refer to the Root Node. Now if you recall how I mentioned the example of people boarding a plan in the Priority Queue section, that few more people arrived which caused us to re-arrange the Queue. Similarly, we have to make sure that we always maintain the Min-Heap Property i.e. Every node is smaller than its child nodes. In order to do that, there are operations like bubble-up (when we insert a Node) and bubble-down (when we delete a node) are used. I won’t go much into implementation detail and will leave these fundamentals as user exercise except bubble-down. Now let’s briefly take a look at the process (bubble-down) of maintaining the min-heap property when we remove the minimum element (Root Node) from the Binary Tree. For instance, In the below fig.8, When we remove Root Node (2) from the tree then the Root Node is empty. What we do is then take the last element from the tree i.e. 14 and make it as the Root Node and then perform a bubble-down operations till the Min-Heap property is finished. Move the Last node to the Root Node. Pick the minimum child between Left and Right and compare it with the Root Node. If the Root Node is bigger than the Minimum child presented in the previous step then swap. The problem statement is simple here, Given nodes (Source, Destination) find the shortest path from Source to Destination or Given a node S (Source), find the shortest path from S (Source) to all other nodes. Constraint: The length or Distance should be non-negative. Dijkstra can not compute shortest path for -ve distances but that’s fine for networks as in reality we don’t have a -ve distance on the networks. SEA –> SJC –> KCY –> WDC –> MIA (cost 40) and we will see next on how Dijkstra as an algorithm will derive this. IMHO, Once you really understand the algorithm, you will see how the above statement is true for Dijkstra SPF and appreciate its simplicity. Now Dijkstra is an iterative algorithm that provides us the shortest path from one particular node (Source) to all the other nodes. It is essentially a greedy Breadth first search(BFS) algorithm. Greedy in the sense that it will pick up the best choice (least cost path) available at each iteration. BFS in the sense that it processes the nodes in the graph in the order of their shortest distance from the Start Vertex (Source Node). Below is the pseudocode of Dijkstra with Priority Queue implementation with modification in RED to stop the iteration when the Current Node is the Target node (Destination). 16 if u == target then break // Exit if the Current Node is Target Node. Step 0 (Initialization) : We assign all the nodes a distance value. Since we are looking from SEA Node perspective, the distance from SEA to reach SEA is “Zero”. All other nodes are assigned a distance of “Infinity” also represented as “Inf”. Practical implementation will use some very high number to represent “Infinity”. Since we will be using Priority Queue for Dijkstra, we will have our Priority Queue Initialized (Which is implemented with Min-Heap) where SEA has a distance of “0” and everything else has a distance of Infinity. Priority Queue will use lesser distance value as a higher priority which will make SEA as the Root Node. Below is the code which does the initialization and that’s how the graph will look like. The Grey color node are the ones which we have visited so far and the Green ones are the ones which we haven’t explored yet. Red color nodes are the one which we have discovered as neighbors of the current node. Note that we will be tracking Dist (Distance or Cost) as variable which is a property of a Node and that will decide Node’s relative position in the Min-Heap Tree (PQ). We will also be using a Predecessor (Pred) variable which keeps track of the predecessor of a Node through which the smallest distance is known. Predecessor Information will be used at the end to construct the Path Information. Hopefully as you go through the iterations, things will be more clear. Extract the Current Root Node from the Min-Heap Tree. That node becomes your current node and we will refer to that node as “u”. If the “u” is equal to the “target”(destination) node then exit. Since we have updated the distance of the Neighbor, we will need to re-adjust the tree to accommodate the position of the Node in the tree with his updated new distance. It’s commonly known as decrease Key operation. Essentially, we are adjusting the tree according to the new distance of the Node so that we maintain the Min-Heap Property. The first thing we will do is that we will pop out the smallest distance node i.e. The Root Node “SEA” from the tree and make it as the current Node. 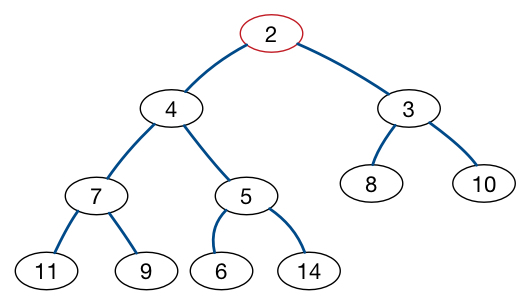 As we take out the Current Root Node from the tree, the Root Node position becomes empty and we need to do something to maintain the min-heap property of the tree. So if you recall our bubble-down operation which is performed when we delete the Root Node, we will move the last node to the Root Node and do a bubble down operation to maintain the min-heap property. So this is how our Tree will look like https://goo.gl/XDVkyu (At the very left) with SEA Root node gone. If you compare this with the initial Tree, you can see we moved the last node MIA to the Root Node. As all the distances are “INF“, Min-Heap Property isn’t violated yet so we are good for now. if u == target then break : This will be skipped as the Current Root Node is SEA and MIA is our Target Node which aren’t equal. We will update the distance to POR as 10, Update the PRED to SEA and perform the decrease key operation to maintain the min-heap property. If you see the cost column in “BLUE” then that means “if alt < dist[v]” condition was met and if it didn’t, then its colored as “RED”. Also the current node column contains the node name and its distance from the source node in the bracket. Now again as you recall that we are using distance as priority to decide where a Node falls into the queue (represented by the Tree). Since we have updated the Distance from “INF” to “10” for all the three neighbors, we have to update the distance values and reshuffle the tree according to their Priority so that the order of Min-Heap property is maintained. This is where the decrease key operation comes into the picture where it goes and update the distance and reshuffles the tree to make sure the tree is updated accordingly. Just to keep in mind that the decrease key operation will run after each time the distance is updated for a neighbor under the “For loop” i.e. 3 times in this case, one for each of the neighbor but I am just showing up the end result https://goo.gl/XDVkyu [Far Right picture] after all the 3 iterations are complete. Below is the table of the updated Cost, PRED values. Now the next question is how do we construct the Path from the Source to the Destination as we weren’t keeping track of that anywhere explicitly and that’s where the PRED variable comes in. Hence the path from the Source to Destination is SEA ==> SJC ==> KCY ==> WDC ==> MIA. You can take a look at the code here and the output https://repl.it/CWFD/0 . If you want, you can play with it as well by changing the source and destination. I hope this was informative to you and if not, then well, it is what it is..